Sometimes you want to squeeze it….other times you want to pump it. That’s why SENSA® has taken “personal” to a whole new level. If you desire a personal lubricant that you can squeeze with a press-top dispenser our 2, 4, and 8 ounce silicone and water based lubricants are available with press-tops. For those of you that are a little more adventuresome and want to pump it, our silicone and water based lubricants are available with a pump-top dispenser in 4 and 8 ounce sizes. 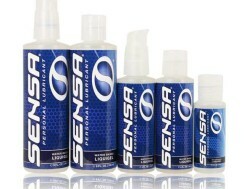 No matter what your personal choice of dispenser types, SENSA® is your only choice in personal lubricants.